(Bloomfield, Conn.) On, Tuesday, April 16, CREC held a groundbreaking ceremony for its new school building in Bloomfield. The state-of-the-art facility will eventually house the CREC Ana Grace Academy of the Arts, a Pre-Kindergarten to eighth-grade school that will combine two current CREC schools – CREC Ana Grace Academy of the Arts Elementary School and CREC Greater Hartford Academy of the Arts Middle School. Presently, CREC Ana Grace Academy of the Arts Elementary School is located in Avon and is Pre-Kindergarten through fifth-grade, CREC Greater Hartford Academy of the Arts Middle School is in the Colt Building in Hartford, and is grades six through eight.CREC renamed the Academy of the Arts Elementary School in 2014 to honor Ana Grace Marquez-Greene, daughter of CREC alumni and former teachers Nelba Marquez-Greene and Jimmy Greene, who was one of the victims of the Sandy Hook tragedy. “As proud alumni and former employees of CREC, who deeply value arts education, it is a very fitting tribute to Ana Grace and all children to have a permanent and dedicated school for arts excellence in the early and middle years,” said Nelba Marquez-Greene. “May this day and every day forward on these grounds be ones of joy, peace, and beauty-making. May every staff, every family, and every child feel safe; and know that love wins within its walls. We are so thankful to CREC for this dedication.”Members of the school community, the Bloomfield Board of Education and Town Council, the State Department of Education, CREC leadership, former and current students and parents, and special guests were in attendance. The ceremony, emceed by CREC Deputy Executive Director Sandy Cruz-Serrano, featured remarks by the school’s Principals Patricia Phelan and Bo Ryan, CREC Executive Director Greg Florio, Superintendent of CREC Schools Tim Sullivan, Chair of the Bloomfield Board of Education Don Harris, and Ana Grace’s brother Isaiah Marquez-Greene. Over 40 students from the Elementary School came from Avon to perform three songs for the crowd as well. “The construction of the Ana Grace Academy of the Arts has been a long process over many years,” said Florio, “and the only part that was missing was a permanent home, and today we begin that process.”“We began with 20 teachers and 150 pre-K and Kindergartners seven years ago,” said Phelan, “since then our school has grown to over 475 students from Pre-K to fifth-grade, and nearly 80 educators. Today it is thrilling to realize our dream of a new school, one that is being specially designed for us.”“My wish for the families and students attending this school is that they truly value what an education in the arts can do. That they have fun and share their learning,” said Isaiah Marquez-Greene. “That they listen to their teachers. That they dream big. That they use what they learn to prepare them for a world that they might never imagine.”“Bringing kids together, to learn together, is going to make our society better,” said Sullivan during his closing remarks. “[The new building] is a down payment on our future so that our society when I get old, and [the students present] are the ones at the microphone, will be a better place.”The new building is slated to open in August 2021 on the 29-acre site. Plans call for more than 157,000 square feet of space, to accommodate 876 students. The bus loop will be lined with painted steel walkway canopies with photovoltaic panels, which will also serve as a roof covering. The East portion of the site will host a grass playfield, while the West portion will host playscapes, adjacent to the elementary school program. Plans also include middle school science labs, magnet-themed classrooms, and a combined lobby and art gallery space, which will surround a Black Box Theater for student performances.CREC Ana Grace Academy of the Arts Elementary School’s website is http://agaaems.crecschools.org. CREC Greater Hartford Academy of the Arts Middle School’s website is http://haams.crecschools.org. Members of the Marquez-Greene Family and CREC Executive LeadershipStudents with Nelba Marquez-Greene, Greg Florio, Tim Sullivan, Patti Phelan, and Bruce DouglasAn architectural rendering of the exterior of the building###The Capitol Region Education Council was established in 1966. Working with and for its member districts, CREC has developed a wide array of cost-effective and high-quality programs and services to meet the educational needs of children and adults in the region. CREC brings nearly five decades of experience in education, regional collaboration, and operations to provide innovative strategies and products that address the changing needs of school districts and their students, corporations, non-profits, and individual professions. CREC regularly serves 36 towns in Greater Hartford, offering more than 120 programs to more than 150,000 students annually. CREC manages more than 35 facilities throughout the area, including 17 interdistrict magnet schools. More information about CREC and CREC’s award-winning schools is available at www.crec.org. (Wethersfield, Conn.) CREC Soundbridge, a leader in teaching children with hearing loss to listen and talk, is under new guidance. Kelly O’Connell assumed the Director position on December 1st, replacing Dr. Elizabeth Cole who was the Director of Soundbridge for the past 16 years.Soundbridge is a state-wide program that provides specialized expertise and technology to promote listening and speaking in children with hearing loss. 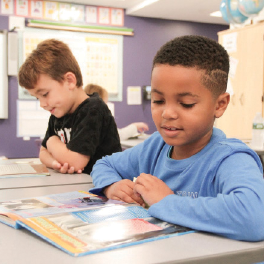 Currently serving over 700 students throughout Connecticut, Soundbridge delivers a full continuum of services designed to meet the varied needs of children with hearing loss from birth to 21.O’Connell’s qualifications for the position are myriad. She has a bachelor’s in Public Relations from Northern Arizona University, a master’s in Education of the Deaf from Smith College, and a Sixth Year Administrative Certificate from the University of Connecticut Neag School of Education. She previously worked as a Teacher of the Deaf at Clarke School for the Deaf in Northampton, Mass. and Teacher of the Hearing Impaired at Soundbridge. She was the Soundbridge Teacher of the Year in 2010 and assumed her prior role as a supervisor at Soundbridge in 2013. “We feel fortunate to have someone with Kelly’s expertise to take on the director position at Soundbridge,” said Deborah Richards, CREC Director of Student Services, the district leader to whom O’Connell reports. ”Kelly has worked over the past few years developing our capacity to serve students in their home districts so she really understands the work that needs to be done.” O’Connell hit the ground running as the new director, and anticipates many exciting updates to Soundbridge’s offerings. She is in the early stages of working with CREC and the Soundbridge staff on refreshing the program’s mission, vision, and branding. “While we are making programmatic changes, our focus will continue to be on developing the speaking needs of children with hearing loss through current research and technology,” said O’Connell. “Through compassion, collaboration, and expertise in auditory access, we serve as the bridge between listening and talking for students with hearing loss.” One change that will affect a small portion of Soundbridge students being serviced is the dissolution of the Soundbridge Elementary and Middle School Academy programs. In the 2018-2019 school year, the Academy program consisted of only twelve students in total, representing 2% of the students with hearing loss serviced by Soundbridge across the state. The changes in the Academy, once considered Soundbridge’s its flagship program, are a result of advancements in newborn hearing screening, advances in listening technology, parent preference toward in-district services, and the educational trends towards integrated classroom environments.“We look forward to continued growth in the provision of services from our consulting teachers of the deaf and audiology services to our districts,” said Richards. “Due to the large volume of students that we serve, Soundbridge is on the cutting edge of changes in technology. Hearing loss is such a low incidence disability, that it is difficult for districts to have the expertise when they may only have a few students with hearing loss at any point in time. ” In response to changes in the field, Soundbridge has placed emphasis on its audiological, birth-to-three, and consulting teacher programs which have all seen tremendous growth over the last decade. Soundbridge will also continue to run their center-based Early Learning Center at the Wethersfield location. The Early Learning Center is an integrated preschool program for children with and without hearing loss. CREC Soundbridge’s website is www.crec.org/soundbridge. ###The Capitol Region Education Council was established in 1966. Working with and for its member districts, CREC has developed a wide array of cost-effective and high-quality programs and services to meet the educational needs of children and adults in the region. CREC brings nearly five decades of experience in education, regional collaboration, and operations to provide innovative strategies and products that address the changing needs of school districts and their students, corporations, non-profits, and individual professions. CREC regularly serves 36 towns in Greater Hartford, offering more than 120 programs to more than 150,000 students annually. CREC manages more than 35 facilities throughout the area, including 17 interdistrict magnet schools. More information about CREC and CREC’s award-winning schools is available at www.crec.org. (Wethersfield, Conn.) Starting in March, fifth-graders at CREC Discovery Academy will take inventory of their current life and map out where their future will lead with a new project titled “Future Quest,” which incorporates real-life decision making, and uses STEM (Science, Technology, Engineering, and Math), writing, and research together to motivate students.The project, part of a new STEM special class that runs from March 11 to April 26, integrates the new International Society for Technology in Education (ISTE) Standards, recently adopted by the State of Connecticut.This is the second year the school has added the STEM special for students, with each grade taking on a unique, integrated project. Clare Neseralla, theme coach at the school, will teach the STEM Special courses. Once a week, students will go to the Science Lab to work on their project. Additionally, the project will be integrated into weekly art classes to teach students about photography and graphic design basics (pictured below).The ISTE Standards “are designed to empower student voice and ensure that learning is a student-driven process,” according to iste.org. Students will look to the future to learn about professional salaries for full and part-time jobs, and the cost of homes, cars, insurance, and taxes. To incorporate writing, and to examine higher education, students will write business letters requesting information from trade schools or colleges, and researching how education can qualify them for different careers.As part of the project, engineers from the Interstate 84 reconstruction project will come and talk to the students about all the engineering fields that have been hired to make their project a success.Neseralla previously taught Future Quest as a teacher in West Hartford and said it was a favorite of her past students.“I am thrilled to be able to duplicate this project with the students at CREC Discovery Academy,” said Neseralla. “It is never too early to inspire a student about a career and let them know about how the adult world works.”Future Quest integrates all the ISTE Student Standards which empower Discovery’s fifth-grade students to become:Empowered Learners - students will take an active role demonstrating technology competency through incorporating Google Drive, spreadsheets, digital photography, and graphic design. Digital Citizens - students will research their future choices and give credit for material they incorporate in their projects. Knowledge Constructors - students use a variety of resources using digital tools to produce a personal, creative presentation.Innovative Designers - students will incorporate photography and graphic design in their personal, creative presentation.Computational Thinkers - students will use electronic spreadsheets to compute the financial results of their future choices.Creative Communicators - students will present this current and future life digitally through art, photography, and graphics. Global Collaborators - students complete interest profiles online and reach out to professionals in their field. They will conduct interviews through email, blogging, forms, phone calls, or in-person meetings.The CREC Discovery Academy’s website is http://da.crecschools.org ###The Capitol Region Education Council was established in 1966. Working with and for its member districts, CREC has developed a wide array of cost-effective and high-quality programs and services to meet the educational needs of children and adults in the region. CREC brings nearly five decades of experience in education, regional collaboration, and operations to provide innovative strategies and products that address the changing needs of school districts and their students, corporations, non-profits, and individual professions. CREC regularly serves 36 towns in Greater Hartford, offering more than 120 programs to more than 150,000 students annually. CREC manages more than 35 facilities throughout the area, including 17 interdistrict magnet schools. More information about CREC and CREC’s award-winning schools is available at www.crec.org. (Avon, Conn.) The winner of the 2018 Connecticut’s Kid Governor® (CTKG) Statewide Election was revealed during a school-wide assembly at the CREC Ana Grace Academy of the Arts Elementary School in Avon, November 21 at 10 a.m. This year’s winner Ella Briggs of East Hampton, a fifth-grader at the school, campaigned on equity, specifically LGBTQ student rights and issues. Her slogan was “Love is Love.” Students were under the impression that they were attending an assembly however, CTKG Officials surprised them with announcement that one of their classmates had won the election. The Hartford Gay Men’s Chorus performed for the students—their first time ever performing in a school. CREC Administration, representatives from True Colors, State Senator Douglas McCrory (CREC’s director of Family Engagement), and State Representative Jeff Currey were in attendance.The assembly began with a video announcing Ella as the winner. Sen. McCrory and Rep. Currey each presented citations to Ella from the State, and Currey presented her with a pin proclaiming her part of Connecticut’s LGBTQ Caucus. Head of CTKG Brian Francesco, Principal Patti Phelan, Ella’s Teacher Chelsea Davis, and Superintendent of CREC Schools Tim Sullivan also spoke.Ella proudly read her victory speech and thanked everyone for their support. The classmates in attendance chanted “Ella! Ella! Ella!” as she concluded.Connecticut’s Kid Governor is a statewide civics program for fifth graders created by the Connecticut Public Affairs Network in 2015. The program offers each school in Connecticut the opportunity to enter one student candidate into a statewide election. All fifth graders in the State are eligible to vote.In 2018 over 6400 votes were cast, a record for the program. Ella’s competitors, were:Eva Greenspan, Eric G. Norfeldt Elementary School, West Hartford. Issue: Child PovertyHayden Xhokaxhiu, Pleasant Valley Elementary School, South Windsor. Issue: Limiting Electronic UseJason Hayes II, Casimir Pulaski Elementary School, Meriden. Issue: Children’s LiteracyMadison Lowthert, Our Lady of Fatima School, Wilton. Issue: RecyclingMelody Valdes, Dr. Thomas S. O’Connell Elementary School, East Hartford. Issue: Food for AllReilly Bard, Plantsville Elementary School, Southington. Issue: Foster CareCurrey, a democrat, whose district covers parts of Manchester, East Hartford, and South Windsor, is openly gay and met with Ella on October 22 to answer questions as she built her platform and visit with other students at the school.“Ella is a beacon of hope and an inspiration to not only Connecticut students and residents, but to individuals across the country. In a charged political climate that is not always tolerant, she has the courage to stand up for basic human rights, and to speak out against the erasure of identities,” said Currey. “Her message that love is love, and her determination to make education safer and more equitable to meet all of her peers’ needs is inspirational and something older generations must listen to.”I am just so pleased that Ella has the confidence to stand up for something that is so very important to her and her whole family,” said Ella’s father Christopher Briggs. “She is really coming into her own, and the support that she has received not only from the faculty and staff, but also the whole student body of Ana Grace, has been very heartening.” “Ella is one of the most remarkable young people I have had the pleasure of meeting,” said Currey “I haven’t stopped speaking about her and her candidacy.”“We are very proud of Ella,” said Phelan.Currey also spent time talking with other students in the lunch room about Ella’s campaign and their support.Ella’s campaign speech began, “I am a proud part of the LGBTQ community and I want to make youth programs all around the state, make school clubs, and help with kids who were kicked out of their homes. Together we can make Connecticut a little bit more colorful. With your vote, we can make a stand, make a change, and make a difference. Vote Ella, campaign, Love is Love.”The CREC Ana Grace Academy of the Arts Elementary School’s website is agaaems.crecschools.org###The Capitol Region Education Council was established in 1966. Working with and for its member districts, CREC has developed a wide array of cost-effective and high-quality programs and services to meet the educational needs of children and adults in the region. CREC brings nearly five decades of experience in education, regional collaboration, and operations to provide innovative strategies and products that address the changing needs of school districts and their students, corporations, non-profits, and individual professions. CREC regularly serves 36 towns in Greater Hartford, offering more than 120 programs to more than 150,000 students annually. CREC manages more than 35 facilities throughout the area, including 17 interdistrict magnet schools. More information about CREC and CREC’s award-winning schools is available at www.crec.org. Workshops and technical assistance in methods for identifying, planning for, and working effectively with special needs children in regular classrooms, including, but not limited to, implementation of student individualized education programs. Educating students through the International Baccalaureate learner profile. This world standard approach to learning prepares students for intercultural understanding and respect.